A sports car races down a highway. The driver’s face is grim and determined. He parks before a government building, strides angrily down a long hall, slams something onto a desk. Thunder crashes ominously as he paces back and forth, obviously making a denunciatory speech to an unseen official. A computer-operated system moves his photo into a file marked “Resigned.” He returns to his home and begins packing for a trip; but he is destined for a far weirder trip than he imagines. Two thin, corpse-like men in incongruous high silk hats approach his doorway; a gas seeps through his keyhole; he collapses unconscious. “Where am I?” the hero demands. The answer is mocking laughter. 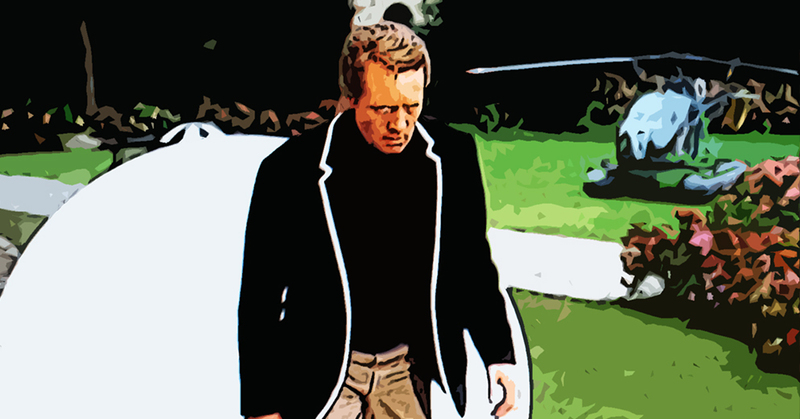 I have been describing the opening scenes of the most remarkable series ever to hit TV: The Prisoner. Even more interesting, 10 years after its first appearance here (eleven years after its premiere in England), The Prisoner has even become a cult. There are actually Prisoner T-shirts, saying “I am not a number: I am a free man,” for sale in head-shops. The reason for this unique success of a show that is admittedly arty, ambiguous and emotionally disturbing is that the world of Number Six is our world; the mysteries and anxieties he confronts are those that we all confront these days. 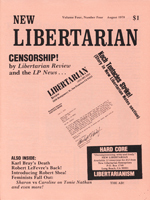 And the ringing defiance of his slogan, “I am not a number” (expanded, in the first episode, to “I will not be pushed, filed, stamped, indexed, briefed, debriefed or numbered!”) is symptomatic of both the growing libertarianism and the growing paranoia of vast masses of people who have become aware that government is not the benign institution we are told it is in high school civics classes and official Liberal philosophy. Every effort is made to persuade/coerce Number Six into becoming sheriff in Harmony. When he finally accepts, he (by the logic of another world) refuses to wear guns. This non-violence does not work in Harmony, of course, and eventually Number Six is maneuvered to wear his guns and use them (in self-defense, of course), seemingly killing a half dozen bandits. Everything abruptly turns into two-dimensional cardboard cutouts and Number Six is back in The Village again. Has he really killed anyone? Well, it turns out that he hasn’t, but the brainwashers, using LSD and hypnosis almost had him convinced that he had killed several people. Ambiguity? Symbolism? Allegory? You would be naive to take “Living in Harmony” only on that level. While The Prisoner was being produced, we now know, similar experiments were being conducted by (among others) the U.S. Army. Operating Mind Control by W.H. Browart (Dell, 1978) gives several cases of persons who, like Number Six, were sent into fantasies, via drugs and/or hypnosis, in which they attempted to kill people who seemed to them to be somebody else. For instance, one private was induced to attempt to strangle his own superior officer, under the hallucinatory impression he was in hand-to-hand combat with an enemy soldier. In Soviet experiments also described by Browart people were sent into hypnoidal fantasies in which they committed “crimes” for which they afterwards felt guilty, even though the acts never happened in public “reality” but only in the “reality” of their own programmed impressions and memories. The irony behind all other ironies of The Prisoner’s Dilemma is that nothing in the whole series is merely arty, or ambiguous, or obscure, as nearly all the TV critics think it is. Everything is a perfectly accurate documentary presentation of modern brainwashing techniques. appeared in Robert Anton Wilson’s column “Illuminating Discords” in New Libertarian, Volume 4, Issue 4 in August 1978.